The catwalks of New York, London and Paris have always maintained the center stage when it comes to fashion. However, with the increase of street style photography fashions from across the world are beginning to be more readily shared and made equally accessible, and the influential footings the three cities had on fashion innovations may be starting to wane. The melting pot of cultures in Honolulu has had a big impact on the islands fashion scene. The influence of the flora and fauna, along with the contrasting landscapes of the tropical forests, the bustling cityscape and the golden beaches has filtered into the islands fashion, and resulted in a blend of a causal and comfortable style that reflects Hawaii’s relaxed cultural attitudes. One export of this small state in particular has had a great impact on world fashion. The extract below is taken from the section titled, ‘Tattoos’. “Not only has Hawai`i influenced manufactured garments, it has also had an impact on body art, such as tattooing. European explorers to Polynesia beginning in the sixteenth century helped to re-introduce the practice of tattoo to European society, although the practice had been in Europe in earlier ages. In 1769 Captain James Cook wrote of tatau among the Tahitians and thus introduced the word into English vocabulary (Blackburn 1999). Polynesian tattoos were rites of passage given to commemorate an achievement, and were made by ‘tapping’ ink into skin using tools made of bone and bamboo. Polynesian cultures differed in their tattoo designs. Traditional Hawaiian tattoos, for example, are typically repetitive geometric and linear designs (though there is evidence of a lizard design) made by inserting vegetal ink under the skin with a tool made of albatross bone (Blackburn 1999). Hawai`i is also credited with helping to disseminate Asian tattoos to the western world. Western-style tattoos were typically singular and depending on the decade and the fashion of the time were worn by outlaws and outcasts of society. 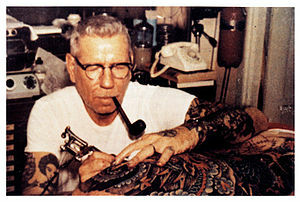 Tattoos were typically only found among prisoners, bikers, and men in the military until the 1970s; common themes were naval motifs, sexualized/idealized women, and hyper-masculine iconography such as weapons and cars (DeMello 2000). In contrast, Asian-style tattoos, especially the Japanese body tattoo called irezumi, covered large portions of the body and were a mixture of iconography and geometry, although it was and still is largely connected to criminal organizations. Whereas western-style tattoos like those found in the United States, covered a small portion of skin, irezumicoats entire body parts (e.g. arms, pectoral muscles, shoulders, backs, etc.) in color and motif. Japanese artists literally used the body as the canvas for their art. Honolulu is the latest edition to the Street Style Series, which looks beyond the trends of NYC and Europe. It joins the already-published Shanghai edition and more are to follow in 2014. This is an exciting time for fashion, as street style photography around the world is documenting a moment in time, when fashion is caught in the context of every-day life. Tags: fashion, IQ magazine, street style, tattoo. Bookmark the permalink. Tattoo Ideas is the perfect way to create the body art.